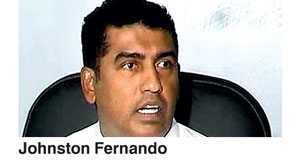 Former Minister of Trade and Commerce and current Kurunegala District UPFA Parliamentarian Johnston Fernando was remanded yesterday till the hearing of the case of financial fraud at Sathosa is concluded. Kurunegala High Court Judge Menaka Wijesundara yesterday ordered that former Minister Fernando and two others be remanded till the hearing of the case pertaining to financial fraud at Sathosa is completed. The defendants, including the former Minister, have been indicted for committing financial fraud at Sathosa during the tenure of Fernando as the subject Minister. Former Sathosa Chairman Nalin Fernando and MP Fernando’s Private Secretary Mohamed Saki are also among the accused. The case against the three defendants will be taken up for continuous hearing, the Judge informed the courts.